The basic premise of the Reducing Emissions from Deforestation and Degradation (REDD+) program seems simple: rich nations pay tropical countries for preserving their forests. Yet the program has made relatively limited progress on the ground since 2007, when the concept got tentative go-ahead during U.N. climate talks in Bali. The reasons for the stagnation are myriad, but despite the simplicity of the idea, implementing REDD+ is extraordinarily complex. Still the last few years have provided lessons for new pilot projects by testing what does and doesn’t work. Today a number of countries have REDD+ projects, some of which are even generating carbon credits in voluntary markets. By supporting credibly certified projects, companies and individuals can claim to “offset” their emissions by keeping forests standing. However one of the countries expected to benefit most from REDD+ has been largely on the sidelines. Indonesia’s REDD+ program has been held up by numerous factors, including concerns about benefits distribution, unclear land rights, political and bureaucratic infighting, complex governance issues, and opposition from a variety of stakeholders, including strong business-as-usual interests. 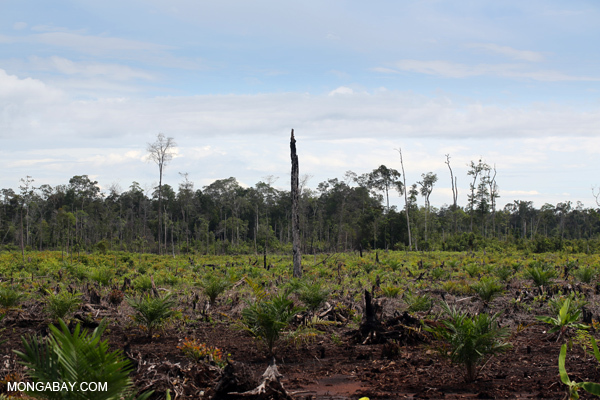 But perhaps the biggest challenge for REDD+ in Indonesia is corruption. Conversion of peat forest in Central Kalimantan for an oil palm plantation. Taken by Rhett A. Butler in March 2013.